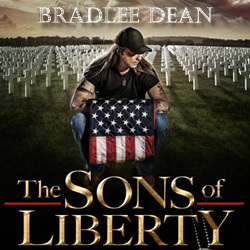 Bradlee Dean -- Have You Been Outfoxed? Most people already know that the state-controlled media is bought and paid for from the top to the bottom. For those that didn’t know, there are 6 corporations worldwide feeding the masses through their financed propaganda in an attempt to rearrange reality into a perceived reality they want you to believe in. As a case in point, a top German Journalist and Editor, Dr. Udo Ulfkatte, has gone public with some shocking admissions on his exposé concerning the media worldwide. He basically admitted that the entire mainstream media is totally fake! Those are his words. He said he was paid and used to educate and lie to the public, as well as how the media is trying to bring war to America. Dr. Ulfkatte also stated that the CIA supported him and informed him on how they get control over all of the major journalists. No wonder why 67% of the American people do not trust the news media. There is little to no truth in these people. The good news friends is that we still have FOX News, right? Wrong! FOX News owner Rupert Murdoch has partnered with sharia compliant Saudi Prince Alwaleed bin Tala, who owns a stake in FOX, as well as Twitter, Citigroup, ABC-TV, Disney. FOX has been used as a moderate for far too long. They have no absolutes. Therefore, there is no difference between them and what America complains about. Let me explain. If FOX is not trying to sabotage a Republican debate by attacking the leading contender in an attempt to hand over the presidency to Hillary Clinton (Megyn Kelly-Donald Trump), it may well explain why FOX News is one of the top ten financial contributors to the Clintons foundations. This may also explain why FOX also put out an article on Sept 3, 2015 titled “Poll says Hillary and Trump are unpopular: why they could win anyway.” This article was posted during Trump’s highest polling numbers and Hillary was being exposed for another high crime against the American people. However, we know that Clinton’s Twitter account came out as 56% fake or inactive, as well as little to no support for her presidential run. Keep in mind, Trump, love him or hate him, is gaining major favorable support nationally while Clinton is not in the minds of the American people as a credible candidate. Also, 40 to 60% of all comments made by the network are completely contrived or blatantly false. America, If you are not careful, the media will have you hating the people who are being oppressed (Law-abiding peace lovers) and loving the people who are doing the oppressing (Law-breaking war mongers). America, you may choose to look the other way, but you can never again say you didn’t know. 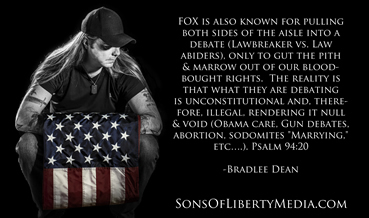 FOX is also known for pulling both sides of the aisle into a debate (Lawbreaker vs. Law abiders), only to gut the pith and marrow out of our blood-bought rights.